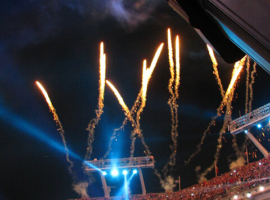 It was a terrific halftime show that inspired the live audience and viewers at home with a combination of Pyro-, Laser and Lighting Effects and hits from “The Who”. 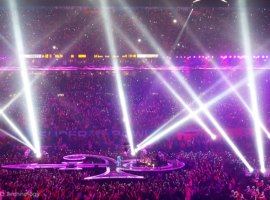 At a time when no one suspected the New Orleans Saints to win the game, the stadium crowd of the 44th Super Bowl in Miami celebrated and enjoyed the extremely popular halftime show. 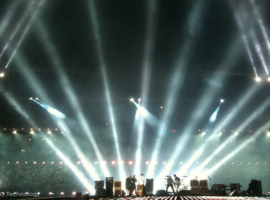 In the 12 minute space, The Who performed five hits out of their repertoire which swept the crowd away. 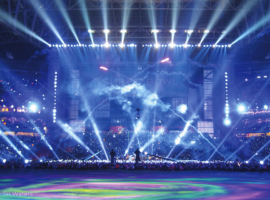 The FALCON Xenon Searchlights were throughout being integrated in the diversified stage lighting show designed by Al Gurdon and shown through a crowning achievement and powerful colours. The technical support was provided by Full Flood. 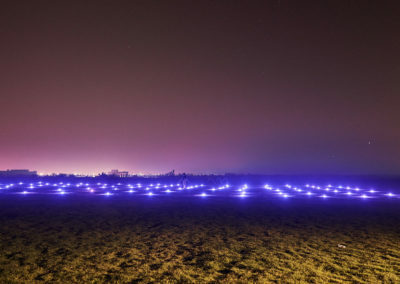 The US service provider already has several experiences using the FALCON range and likes to frequently use the searchlights manufactured by alpha one. 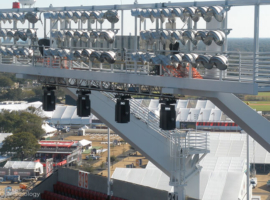 A&O Technology USA supplied Full Flood with a total of 12 FALCON 6000 CMY and 14 FALCON BEAM 7000W. 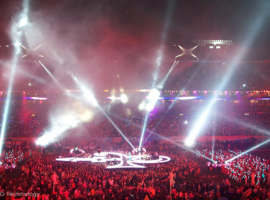 This year marks the fourth time that A&O USA successfully supported the Super Bowl half time show. 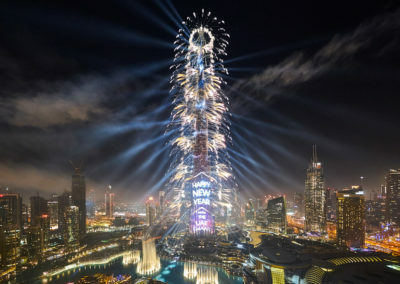 With previously staging performances by Prince, Tom Petty and the Heartbreakers and Bruce Springsteen and the E-Street Band, it was now the worldwide famous english Rock’n Roll band “The Who” who shined in the spotlight. 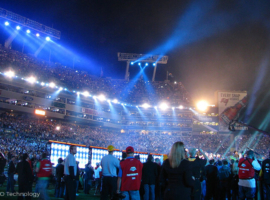 This XLIV Super Bowl was watched by an average of about 106.5 million US viewers (a total of 151.6 million tuned in overall), according to NFL.com, which is a record breaking number and marks the 44th Super Bowl as the most watched ever in sport history. 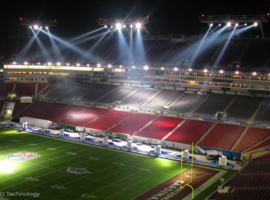 Apart from the US channel CBS, the German state channel Das Erste broadcasted the final match of the NFL live. 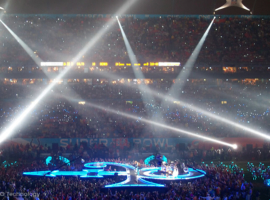 For the second time, A&O Technology this year provided lighting equipment for the half-time show at one of the world’s great annual sporting occasions:the Super Bowl. 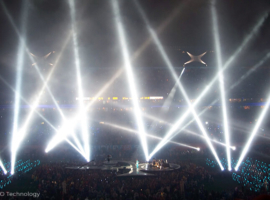 FALCON® 6000 and FALCON® BEAM xenon searchlights played key roles in the halftime show. This was in fact the FALCON® 6000’s first major outing. 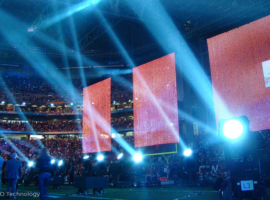 The 42nd Super Bowl was contested in February in the stadium of the University of Phoenix in Glendale (Arizona) and watched by over 97.5 million viewers on US television. 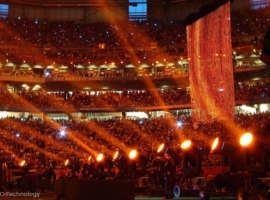 Emerging as winners of the coveted Vince Lombard trophy this year were the New York Giants. 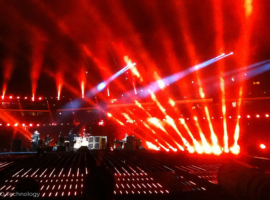 The halftime show at Super Bowl XLII was again one of the highlights of this sporting mega event. 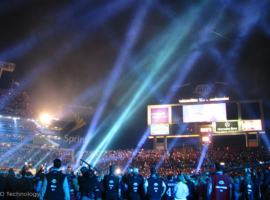 Headlining on stage this year were “Tom Petty & The Heartbreakers” whilst the lighting design was the work of Bob Dickinson (Full Flood) at whose behest the service provider A&O Technology supplied the FALCON® BEAM 7,000-watt and FALCON® 6000 searchlights from the manufacturer alpha one used in the course of the show. 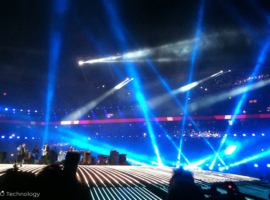 The eighteen 7,000-watt searchlights positioned on the ground just outside the playing area provided background effects to the rear of the stage, while the fourteen FALCON® 6000s, flown from trusses, created beam effects above it. 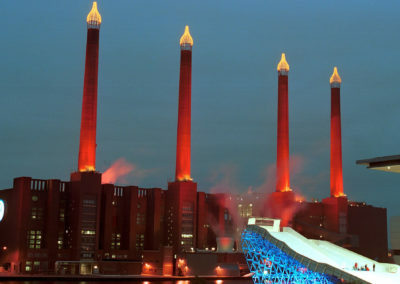 The response the A&O team received from the client in the aftermath of the event was highly positive. 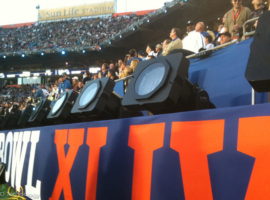 The halftime show at Super Bowl XLII was produced by Don Mischer Productions and White Cherry Productions. 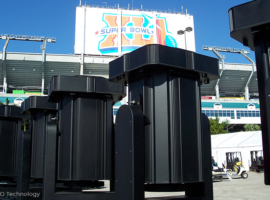 Prior to the Super Bowl finale, ten FALCON® BEAM 3,000-watt units were deployed in front of the Jobing.com Arena for the NFL Pepsi Smash concert series. 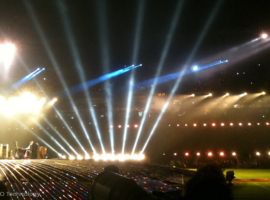 Positioned to the left and right of the nearby stage, upon which stars like Mary J. Blige, Maroon 5 and RBD were performing, the FALCON®s provided impressive zoom and shutter effects. 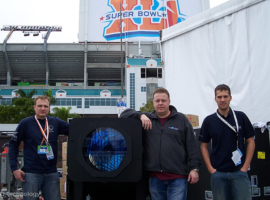 Miami, Florida: Arrived in Miami for Super Bowl XLI, alpha one’s new 7k xenon FALCON BEAM searchlights were shared center field at this year’s Pepsi Super Bowl Halftime Show where the music artist Prince, one of the world’s most electrifying performers, was set to perform at Dolphin Stadium in South Florida on Sunday, February the 4th. 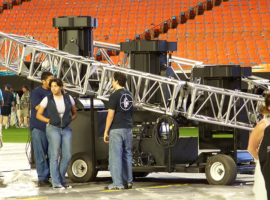 Emmy Award winning lighting designer, Bob Dickinson, used the new FALCON BEAM fixtures in clusters of three on custom field carts to augment the 12-minute spectacular. 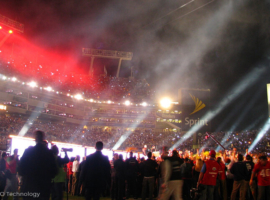 The Super Bowl is the nation’s highest-rated TV program. 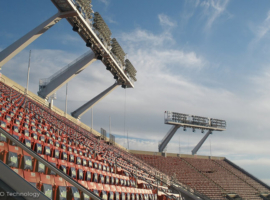 More than 141 million viewers watched last year`s game in the U.S. alone. 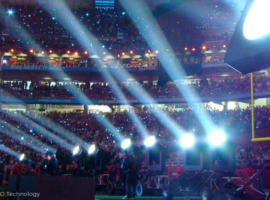 This year`s Super Bowl was broadcasted to a potential worldwide audience of one billion people in more than 230 countries and territories.